In this publication the author wants to give an overview for the Ethiopian law student and the wider public on the modern law of their country. This access to modern law in Ethiopia should, however, not be separated from the historical legal tradition and legal culture of Ethiopia. During Ethiopian history this tradition has developed several remarkable codifications like the Ser'ata Mangest or the Feta Nagast, by which Ethiopia joined the family of Roman Law. 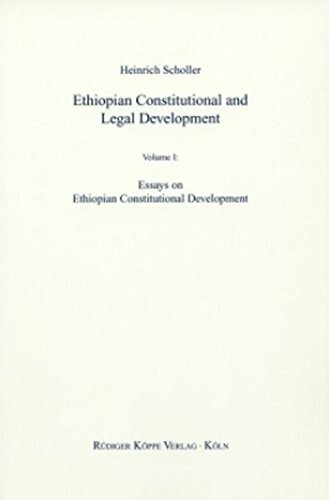 In this first volume the focus is more on general aspects of the legal sources, comparative constitutional law, development of human rights in general and in Ethiopia as well as the development of constitutional review. The author taught at the Law Faculty of the National University of Ethiopia from 1972 to 1975 and has visited the country regularly since then. This volume consists of early publications and of papers either presented to workshops concerning Ethiopia, which were very often organised by the Friedrich-Ebert-Foundation during the years 1992 and 2002, or given during different conferences on Ethiopian law mainly at the International Conferences of Ethiopian Studies (ICES). The representation of Ethiopian law is based on the comparative legal methods, especially by the use of European and American models. So, the near legalistic method is enriched by a comparative approach. The forthcoming second volume will extend the presentation to legal history and legal sociology, so that it will be possible to use the two volumes not only for constitutional law but also for legal theory. 1. Ethiopian Constitutional and Legal Development. Vol. 1: Essays on Constitutional Development.